Occasionally I look at past articles to see what I was writing about. In many cases the ideas and links I was talking about many years ago are still relevant today. I think that's true of many bloggers. So, how can we turn our blogs into lesson plans that students (young and old) spend time reading and learning from in future years? One of the problems with blogs is that many of the links used in older stories no longer connect to what we pointed to at that time. However, I think you can see the intent of these articles and the consistency of purpose over many years. March 30, 2006 - I pointed to a post about advocacy, written by Ethan Zukerman. I titled my article "Collaborative Blogging for Strategic Reasons"
March 25, 2007 - I was writing about the Talent needed in non-profits and encouraging people to attend the May 2007 Tutor/Mentor Leadership and Networking Conference. This article includes a video created from an earlier conference. March 25, 2008 - Want to be happy? Give money away. This article points to Scientists at the University of British Columbia have proved thathttp://www.blogger.com/img/blank.gif acts of philanthropy can be a short-cut to achieving happiness. March 24, 2009 - I wrote an article encouraging teams from college fraternities and sororities to adopt the Tutor/Mentor Connection strategy and showed my own involvement with the Acacia Fraternity at Illinois Wesleyan University. March 29, 2010 - "Act Now. Invest in Youth" was the title of this article. 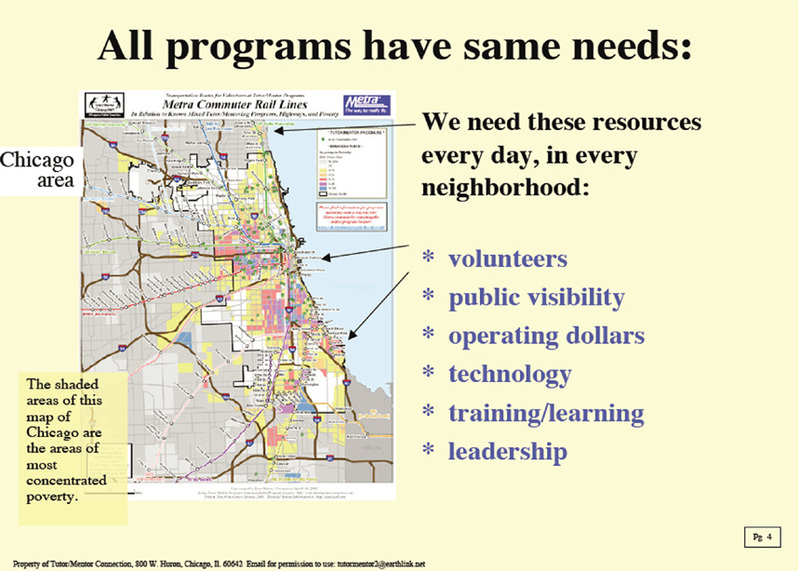 I talked about how the Cabrini Connections program which I led from 1993-2011 needed money, then I included a map showing how tutor/mentor programs in all parts of the city also needed money. 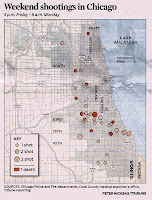 March 31, 2011 - Chicago 3rd Most Segregated City in US - was the topic of this article. I called on leaders from the 50 largest cities in the US to connect with each other since the size of these cities presents different challenges to overcoming racism, poverty, poor schools, etc. Shortly after writing the March 2011 article the Directors at Cabrini Connections voted to discontinue support for the Tutor/Mentor Connection. 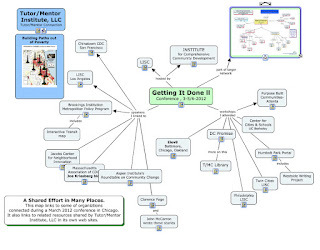 In July I left the organization after founding it in 1993, and created Tutor/Mentor Institute, LLC to continue to support the T/MC strategy in Chicago, while also looking for ways to help similar intermediary groups grow in other big cities. I hope you'll be able to use some of the ideas from these and other blog articles and that we can connect around these ideas and strategies. 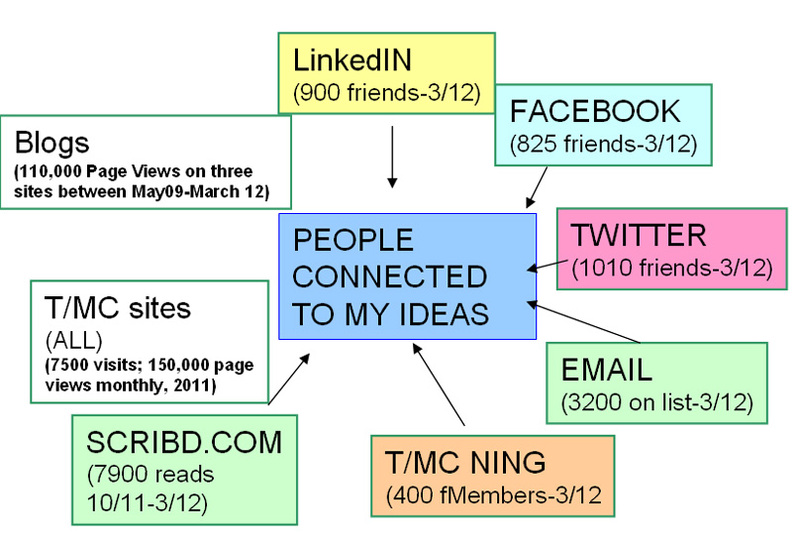 I'm on Facebook, LinkedIn, Twitter and host a forum at http://tutormentorconnection.ning.com. There are plenty of places to connect. Making Sense of Info. Using it to solve problems. One of the first things most people say after talking to me, or visiting my web sites is "there's a lot of information!" Some are really saying "too much" information. That's not the way I see it. Instead I see a constantly expanding wealth of information that young people and adults can learn from over a lifetime in efforts to reduce poverty in the US and the world. The map below shows the different sections of my library. The actual link is here. So how do I see this? My library points to people from around the world who are brighter than me, better writers, and better able to visualize ideas. By hosting links to these ideas in the Tutor/Mentor Institute, LLC library, I make these ideas available to anyone who visits my site and browses the links. I created this explanation of the four-part Tutor/Mentor Institute, LLC strategy yesterday in preparation for an on-line discussion scheduled for April 15. The first part focuses on aggregating information. The second part focuses on advertising and network building, intending to increase the number who view this information. The third part focuses on facilitating and helping people understand and use this information. A few months ago I pointed to some blog articles written by Vance Stevens, where he introduced the idea of MOOCs (Massive Online Organized Curriculum). Today I read an article by Steven Downes, which shows the potential and challenges of MOOCs. I'm trying to take this a step, maybe many steps, further. First, by aggregating information about non-school tutor/mentor programs in Chicago I'm inviting others to help make sense of this information. By using maps to show all poverty areas in the region, and concept maps to visualize ideas and strategies, I'm trying to focus people on strategies that build the entire system of supports, not just a few good programs in a few places. How many programs are there? What is the availability of programs in different poverty neighborhoods, based on type of program, age group served, size, etc? How do programs differ from each other? What do they have in common? What are their challenges? How can a collective effort including business, faith groups, political leaders, etc. help overcome the challenges and make more and better programs available in more places? 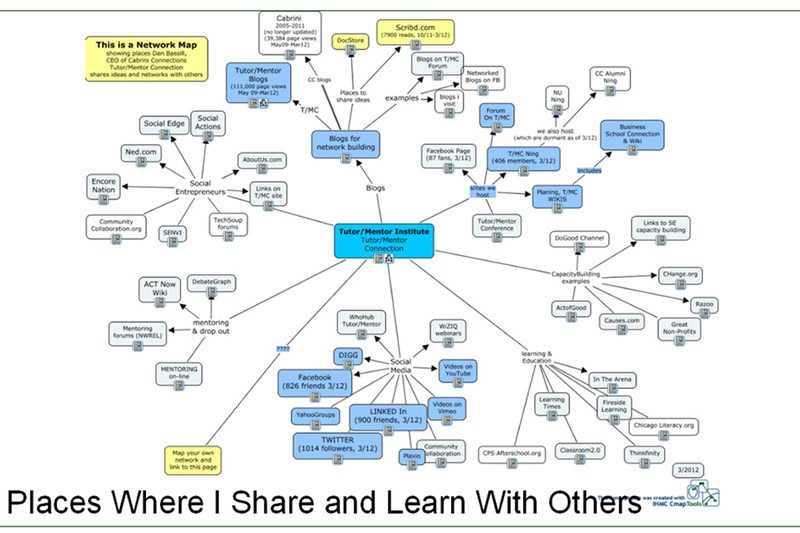 Second, I'm trying to find people who will help bring people in Chicago and the world together in a MOOC focused on building a shared understanding of the information represented by the 2000+ links in my library. Instead of focusing on reading, writing, math that we want kids to learn I'm focusing on problem solving skills and knowledge that young people and adults can use throughout their lives to close the gaps between rich and poor in Chicago and other cities. Finally, I'm trying to find people who are already doing this who want to add me to their team, and people with the talent needed to do this 'sense-making' and organize a MOOC along with other forms of mentoring and learning. In the book titled The StarFish and the Spider, decentralized organizations were described, along with platforms that enabled millions of people to connect with each other. Many people need to be owners and contributors to this process, not just me. Many places can be hosting these ideas, not just my web site. As long as we are connected in one, or many, systems of navigation, learners can find their way through the library and find places to support their own learning and problem solving. As a result of better understanding of poverty and how other people are working in different parts of the world to close the gaps, along with a better understanding of the revenue systems that need to support on-going efforts in many places, more people will begin to use the maps and information library available through platforms like the Tutor/Mentor Program Locator, to search out places where they can offer time, talent, dollars, and their own growing knowledge. That's the fourth step in the Tutor/Mentor Institute, LLC strategy. Over the past 20 years I've done much work to build the platform, aggregate information, and build a network of people and ideas. Over the next 10 years I hope to find investors, benefactors, partners who will turn this into a MOOC and a constantly expanding network of people and organizations working in many ways to help share these ideas. Based upon my own experience leading a volunteer-based tutor/mentor program and survey's I've done to determine the needs of others, I think I'm safe to say that most of us spend a lot of energy looking for dollars, talent, volunteers and other resources that give us the ability to help the kids and volunteers who are part of our programs. If we all have the same needs, and most of us have limited advertising dollars, how do we create greater attention and a greater flow of needed resources, without increasing the costs of finding these? Good question. I wish I could find places where leaders of tutor/mentor programs were getting together to talk about this on a regular basis. I've hosted conference every six months since May 1994 and host a forum on Facebook, Linked In, and Ning, but there is very little participation from leaders, fund raisers, board members and most importantly, donors. While I'm trying to find ways to bring leaders together, I'm also innovating ways to aggregate information that helps volunteers, donors, parents, youth find existing programs in the city. 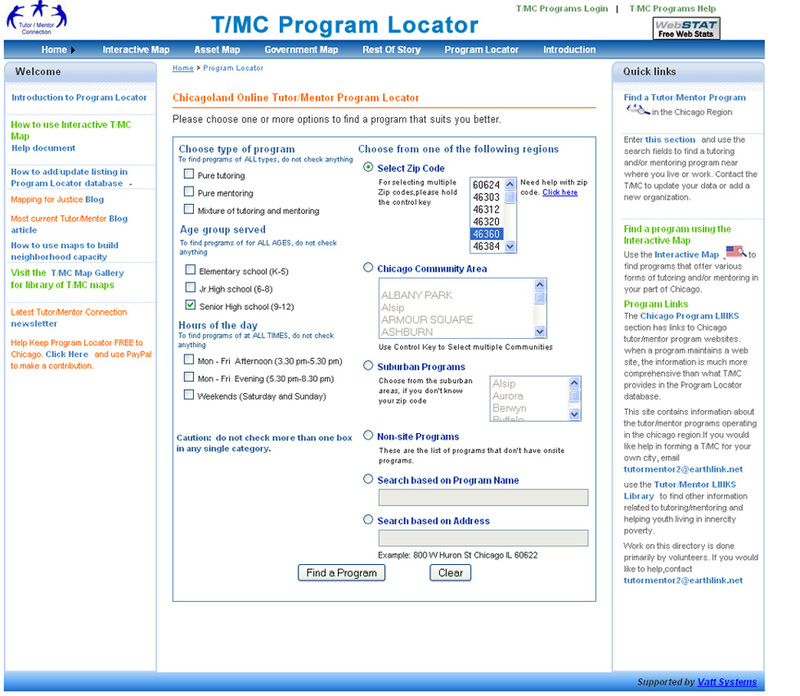 Below is a screen shot of the Tutor/Mentor Program Locator "inquiry page". 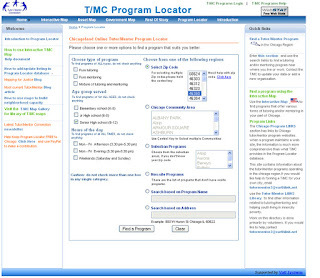 You can sort this by type of program, age group, zip code, and find contact information and web site links for any program fitting your search description. You can put in a community area name, or even the name of an organization. If it's in our database, it will come up on a Google map. This does not help you if your program is not listed, or the information is out of date. Email me at tutormentor 2 at earthlink dot net and I can help you update your information or add (or delete) a site. In addition, this does not help any of us if too few potential volunteers, donors, reporters, etc are looking at it, or know how to create their own map from the interactive map feature. You can zoom into a section of the map, click the "print screen" button on your computer and paste the map into your power point, Adobe, or a word document. Then you can use the map to show where you are and make a case for resources to support programs in this part of the city. However, you can also write about the Program Locator in your own blog, and add a link to it in your links library. You can even point to it on Facebook, Twitter or your Linkedin page. 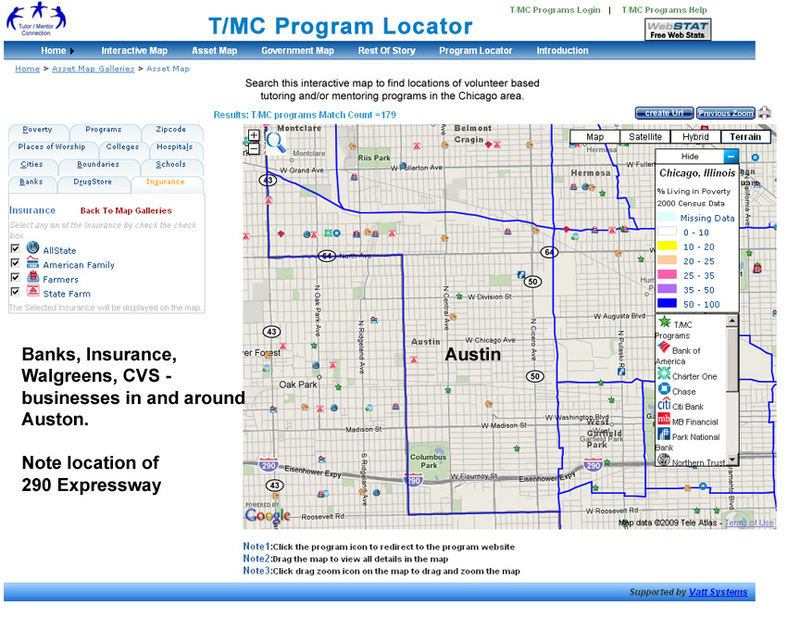 If dozens of programs and community leaders are writing about this resource, instead of just me, more people will be searching the different parts of the city to look for you and your program's web site. If you're a business or philanthropist and you'd like your name on this service, I'd be happy to offer that opportunity in return for some money each year to keep the technology working and updated. If you're in another city that does not have a program locator or someone writing about helping tutor/mentor programs all over your city, the way I do, I'd like to offer you my help to duplicate this. As I learned during this event I added new links to the Library at http://tinyurl.com/TMC-Library so that while I was learning I was also passing on these ideas to others who might visit my web site and learn from me. 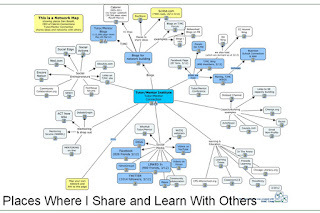 This graphic shows how I share information in many web sites and how this pulls people from all over the world to this information and to my own ideas for helping tutor/mentor programs grow in high poverty areas. It's impossible to give a precise count of how many people have visited my sites, but the visit count is well over 850,000 since 1998 when I began hosting a web site. Yet, the number of people who I share ideas with is even larger. This map shows the places I host information and some of the many places where I participate in web forums hosted by others. This includes Facebook, Linked In, Social Edge and numerous other places where people share ideas related to social change, innovation, collaboration, knowledge management, poverty, education, etc. See live map, here. I'm going to be hosting a discussion on April 15, at 8am Chicago time, in the Webheads group (see Learning2Gether site). I'll be describing the 4-part strategy that I've been developing for over 20 years. This is FREE, very informal, and one of many places where I hope to share ideas that lead to more people acting consistently and strategically to help mentor-rich programs reach low-income kids, with a wide range of learning, mentoring and career-focused activities. The Illinois Primary is today. How many are voting? I did. However, I wasn't voting for anyone who I really felt was providing the type of leadership needed to make a long-term change in the urban warfare taking place in Chicago and other cities. No such leaders are on the ballot for either party. 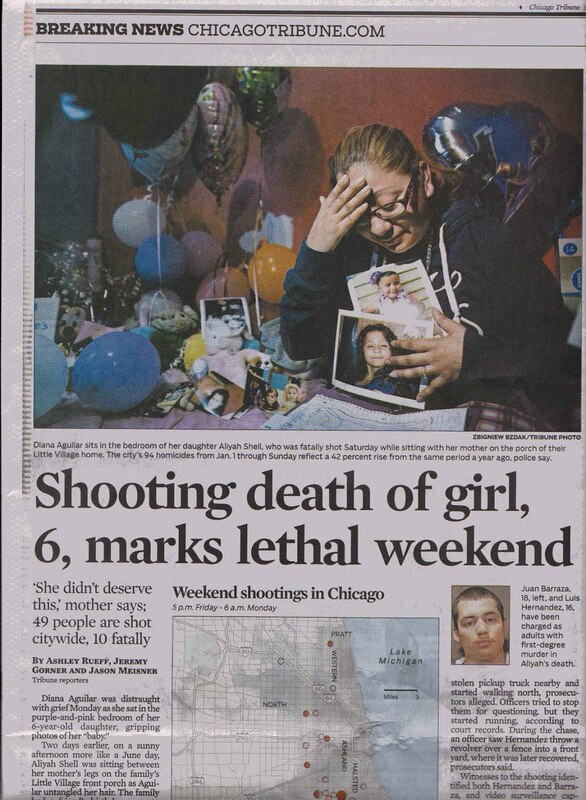 The story on page 7 of today's Chicago Tribune is one that I would like to see more politicians focus on. That's because it relates to education, jobs, housing, race relations, equality, justice and most other issues. In the past 7 years I've written over 101 stories about violence in Chicago. In many of these I've included maps from the Tutor/Mentor Program Locator, that people can use to determine if there are any non-school tutor/mentor programs in the area. 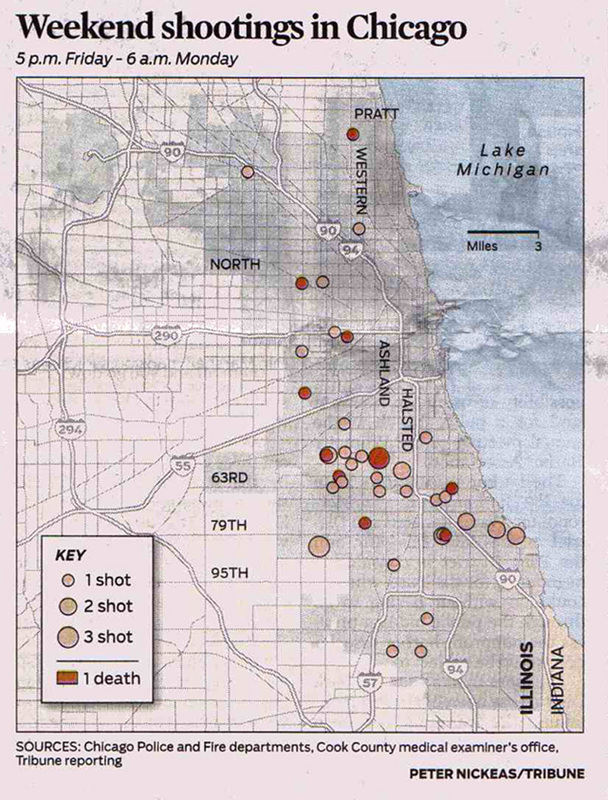 The map in today's Tribune shows where these shootings took place. You can see a large concentration in the South and West parts of the city. 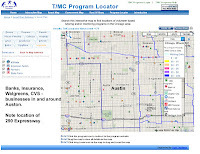 Using the Tutor/Mentor Program Locator you can zoom into sections of the city and build your own map. Then you can convert that to a JPG and put it in your own newsletter, Facebook page, or blog article, demanding that elected leaders, businesses, faith groups and universities in the area become more strategic in making mentor-rich, career-focused tutor/mentor and other learning programs available in the area. If you're a student, educator, or volunteer looking for a meaningful use of your time, you can help us collect information about existing tutor/mentor programs in different parts of the city. 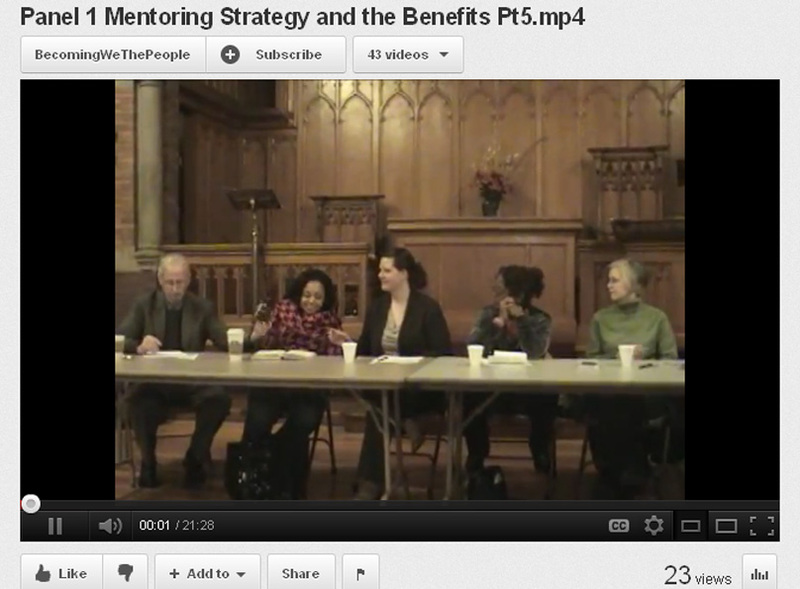 You can lead discussion groups to compare local programs to programs in other parts of Chicago and in other cities. When you see good things happening in other programs you can help mobilize the resources needed to incorporate these good ideas in neighborhood programs. I DON'T KNOW A QUICK FIX TO STOP THE VIOLENCE!! I do believe that if we aggregate information showing how others around the world are trying to change attitudes, aspirations, and habits of young people, we can find ideas that will help us build world-class efforts in Chicago neighborhoods. I'm aggregating information in the Tutor/Mentor Connection library. I'm building a database of tutor/mentor programs. I've been doing this since 1993. However, I'm still paying many of the bills from my own savings and doing much of the work in my own home office because I've not yet enlisted city leaders to understand, adopt and support this effort. I encourage you to read some of the strategies I've posted here and here and in the articles written on this blog for many years. Share these with co-workers, other students, friends in other cities. Add your own ideas. Expand the network of people looking at this information and using it to make more and better programs available to help youth to jobs and careers instead of street violence, jail and death. This quote is from the conclusion of this article describing workforce challenges facing the US and other economies. "One strategy is for companies to make talent development a competitive advantage; when the critical resource is talent, companies that can find a steady supply of highly qualified workers and teach them distinctive skills should outperform rivals who can't"
This Tutor/Mentor Institute, LLC article titled "Role of Leaders" shows a strategy companies can take to build skills of future AND current workers. Today I posted an essay title The Tutor/Mentor Business to my Scribd.com account. This was written in 1997 by Sara Coover Caldwell, who was one of the original founders of Cabrini Connections, Tutor/Mentor Connection. When Sara wrote this in 1997 she also wrote a script for a TV show centered around what happens from August through May in a tutor/mentor program. Our goal was to expand the essay into a book and to use the TV show to build visibility for tutor/mentor programs and raise funds to support our efforts as well as those of other programs in Chicago. I also posted a second essay, talking about the network-building that I continue to do through the current Tutor/Mentor Institute, LLC structure. 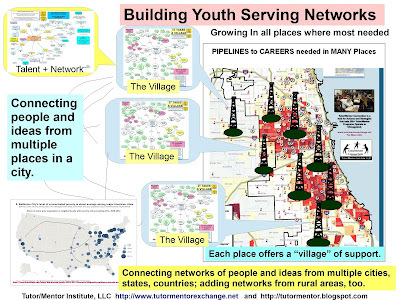 In this essay I show how connecting networks using maps, links libraries, conferences and on-line communities can increase the power of people around the world who are trying to give a voice to youth who have no political power in this world. After you read the Tutor/Mentor Business I hope you'll also read the Network Building story. On the final page I point to this blog and other places where part of this story is available on line. However, it's not yet compiled in a book, or in a course outline being taught at some university. We still don't have the TV show, even though we do now have a Tutor/Mentor Institute YouTube channel. If you'd like to be the writer, producer, publisher or benefactor who helps me compile this information into book form, or in a TV series, just introduce yourself and join the network. This blog titled "Collective Impact: Moving the Needle on Our Nation’s Challenges" includes a video of a recent panel discussion convened by the Center for American Progress. On January 30 a group of mentoring program leaders shared some ideas about the importance of mentoring, as well as some of the challenges. There are five videos. You can see one here. I've you've not taken a look, please browse and bookmark the Tutor/Mentor Institute, LLC video channel on YouTube where you can find the Mentoring Panel and other videos. In one of the sessions of the Getting It Done II Conference I attended Monday and Tuesday of last week, a facilitator defined "organizing" as an intentional effort to obtain relational power, which translates to political influence, philanthropic influence and community influence. I was impressed by how well Community Development Organizations have been able to mobilize and obtain this type of power, and I was also humbled by how far I and other youth development organizations might need to go to achieve a similar level of power and influence. Over the past few days I've been visiting web sites of people who were speakers and workshop leaders at the conference. 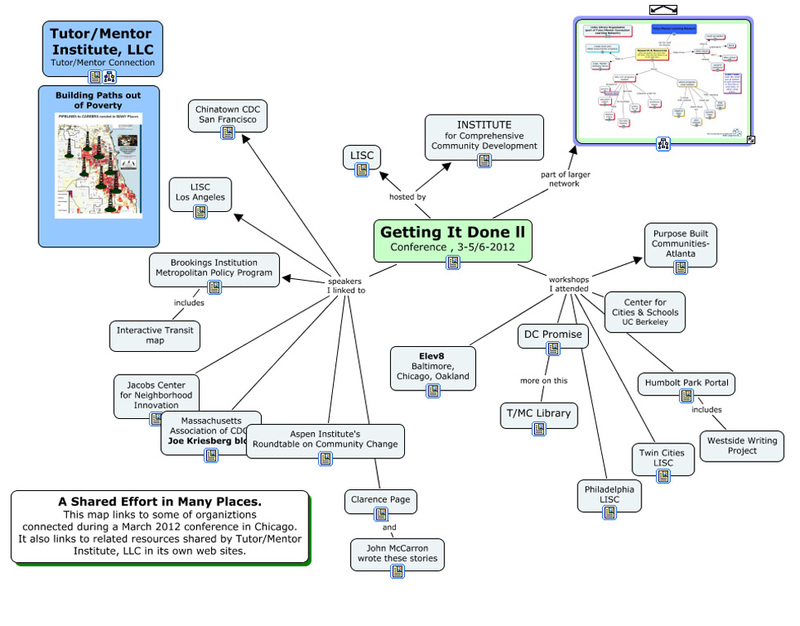 I added some to this section of the Tutor/Mentor Library and I created the map below to show the range of organizations this conference brought together. You can see this actual map here. 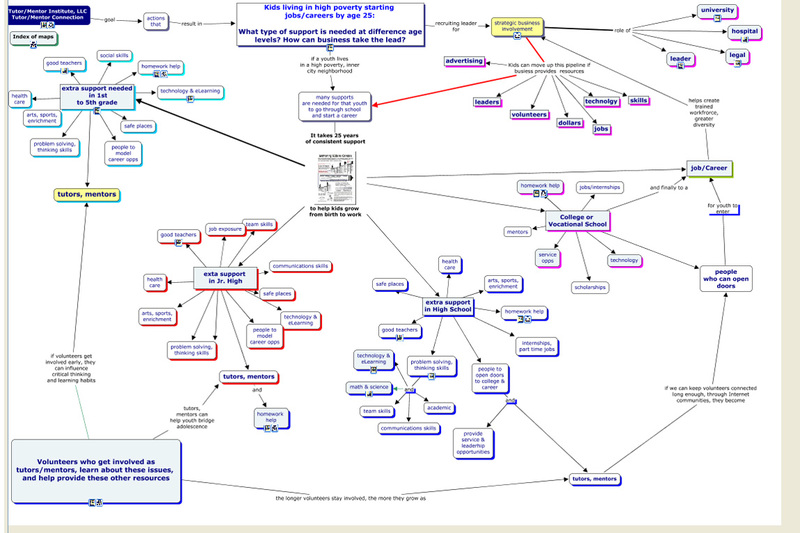 Last October after I attended a DropOut Prevention Conference I created a similar map, which you can view in this link. By creating these maps and putting links into my library I'm sharing what I learn every day with anyone who visits my web sites or reads my blogs. Based on what I've read of knowledge management over the past decade, this is a value because it saves other people time in finding this information and helps them to see how one idea or network fits together with other ideas and networks as part of a larger collective effort to help kids from poverty areas get the support each needs to move through school and into jobs. Then, today, I was introduced by my Facebook network to an article titled "Knowledge and Praxis of Networks As a Political Process" written by Yannick Rumpala from the University of Nice, in Nice, France. 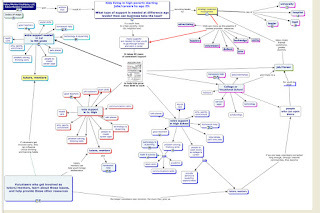 In 17 pages Dr. Rumpala provided numerous reasons for mapping and understanding networks, as part of an effort to achieve critical mass and POLITICAL influence. In one statement he wrote "A reticular vision can be a way to rethink the idea of citizenship." As I read this I saw many things that I've been doing intuitively but with extremely limited talent and resources. I saw the potential of connecting with a much larger network of thinkers and innovators who were mapping ideas, networks and processes and making this information available to support community and political involvement throughout the world. I hope some of my readers will take some time to read this paper and look at the maps I've created. I'll look forward to hearing from you and working with those who see the potential of what I've been doing and what Dr. Rumpala is describing. YLTSIG area and say hello! great if we could tell folks where to go for the same reasons as above. - Social media (twitter etc) this can be used at a distance effectively. I've written about many conferences that I've attended in Chicago and always wish the organizers were setting up on-line communities that would enable participants and speakers to interact with each other before, during and after the event. This demonstrates that it can be done. I attended a Voices4Illinois Kids Count event Friday and received the 2012 Illinois Kids Count report. The report contains essays from many leaders concerned with the well-being of kids. Several were on the panel of speakers Friday. I took notes of what they said, and I read through the report. Kathy Ryg, President of Voices, closes the meeting (and the Kids Count report) saying "in this pivotal election year, children need adult voices to speak on their behalf over the din of political rhetoric." We need adult voices doing this every day, for many years, not just election year. I have piloted the uses of maps because I feel that it's hard to understand data tables such as those in the Kids Count book. With a map you can create a story, like the one showing the 7th Congressional District. 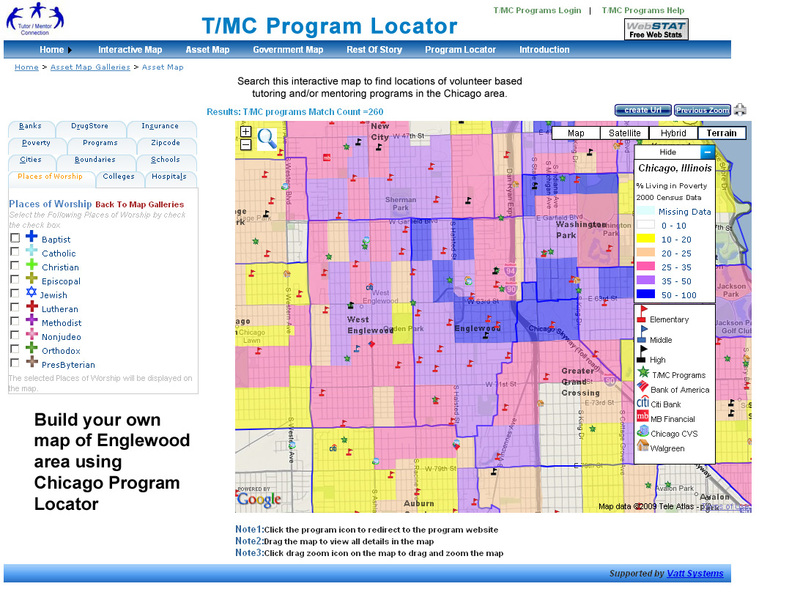 Using the interactive maps on the Chicago Tutor/Mentor Program Locator anyone can be creating maps to point more people to places where kids need help, and to hold business and other leaders accountable for how and where they help. While the maps and charts are helpful and I'd like to see them integrated into the communications of all organizations concerned with the well-being of kids and families, they are useless if no one is looking at them. I've been sharing ideas on this topic for nearly 20 years. 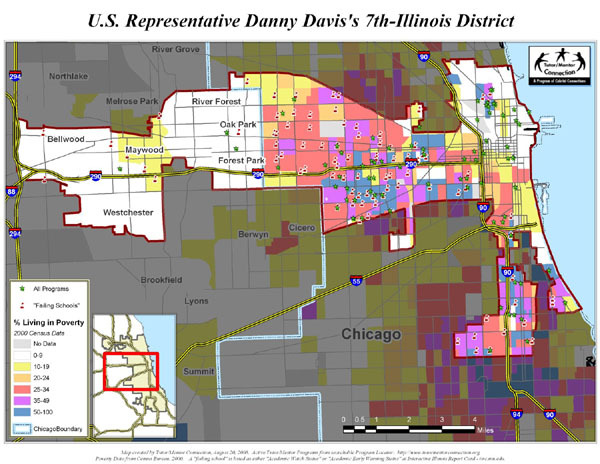 I've created maps like this one of the 7th Illinois Congressional District, suggesting that voters should hold elected representatives accountable for how much they do to support programs in their district that improve the well-being of kids. I share these stories and show how maps can be used in pages like this. Since I started the Tutor/Mentor Connection in 1993 my goal has been to collect and share information produced by others, such as Voices 4 Illinois Children, so more people connect with that information and respond to what smarter people than me are writing about. 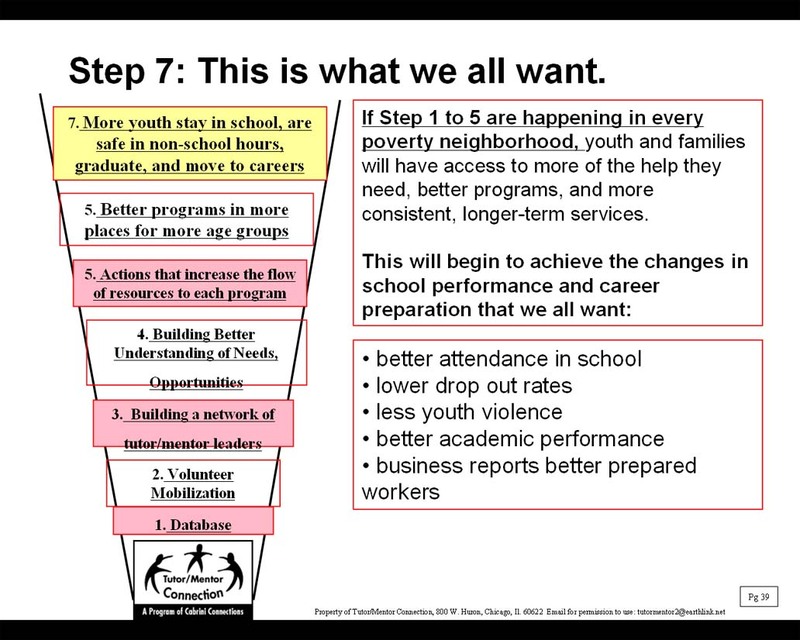 We all want a better future for kids, but to reach our collective goal we need to be working in strategic ways for many years, as the chart above suggests. 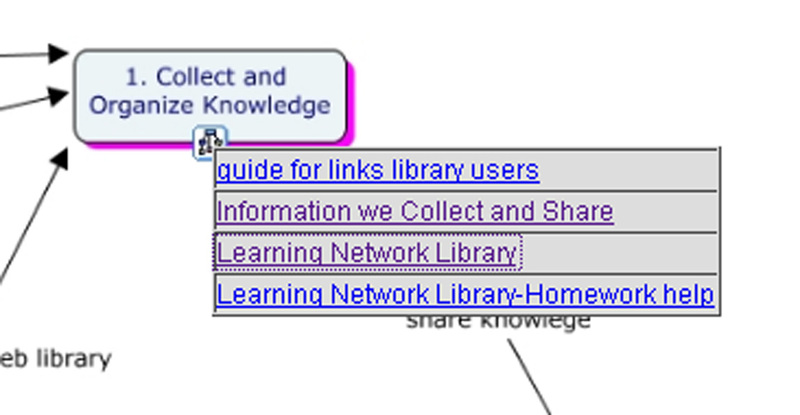 At the base of this chart is the work of collecting, organizing and sharing information that others can use. 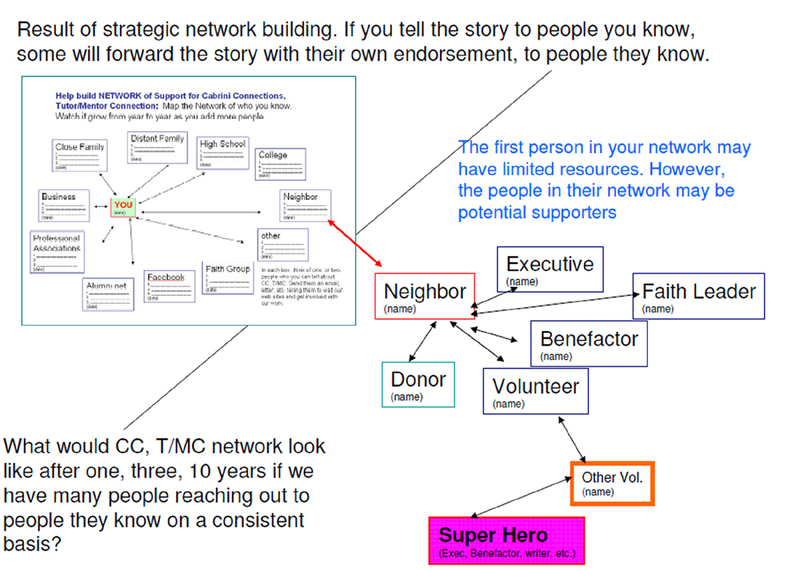 I created this "network building" chart almost 16 years ago, to show how volunteers, students and anyone else who was concerned with kids could be passing on the information I share to people in their own networks, and could be hosting small-group discussions to help people understand and use this information. 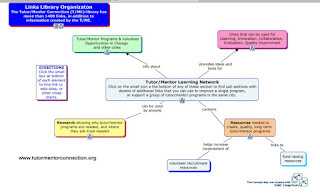 I've been trying to find volunteers, partners and sponsors who would help me map the growth of the Tutor/Mentor Connection network since 1993 so that we could better demonstrate the impact from our consistent communications and network-building strategies, and so we could make our network more available to its members and to others who share the same goals. I have shared ideas about network building on the Tutor/Mentor Institute, LLC web site and on Scribd.com. If we want to change the "public will" we need to get many more people personally involved. This means any leader who is already involved and sharing ideas in forums and publications and on their own web sites can integrate the maps, charts and ideas I've shared so that while I'm trying to increase the number of people looking at their ideas they are trying to increase the number looking at the ideas I share. The result will be more people taking personal responsibility for how we expand the number of people who get involved and how this ultimately leads us to the future we want for our kids in Illinois and throughout the country. I attended a Voices for Illinois Children Symposium today in Chicago where the 2012 Illinois Kids Count Report was distributed and where speakers gave the bad news about how many kids are now in poverty in Illinois and how this negatively affects their future and costs the state and the nation billions of dollars. One speaker was Patrick McCarthy, President of the Anne E. Casey Foundation who collects and shares data related to the well-being of kids on an annual basis. The Kids Count Data Center is a great place to find resources and information. I'll write more about that over the weekend. In his opening remarks McCarthy talked about how America is a "nation obsessed with statistics" and how he "would love to see a fraction of that energy focused on the well-being of children and families". Me too. In fact if you were to read all of the articles I've written over the past six years on this blog, most focus on strategies that would expand the number of people looking at this information, and the number who have a personal connection with the program so they empathize and are willing to sacrifice time, talent and dollars to improve the future for disadvantaged kids in America. 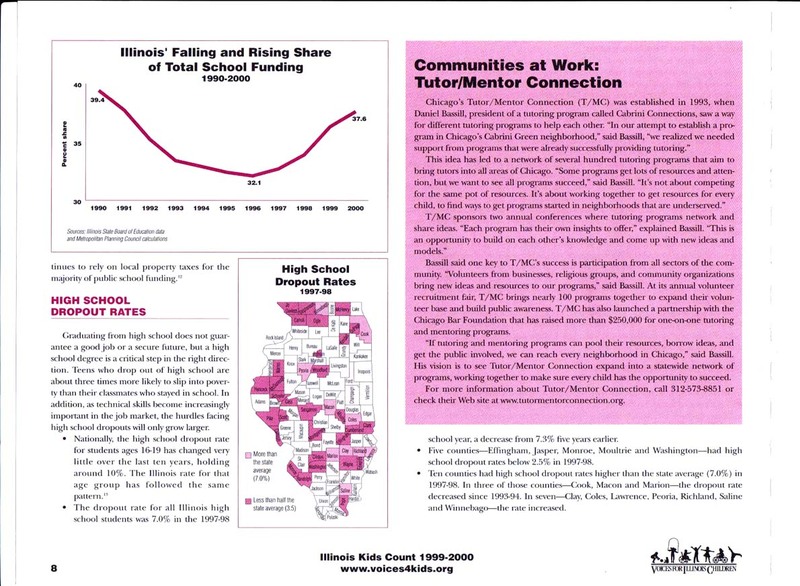 As the image below shows, I have been delivering this message for more than 15 years and Voices for Illinois Children thought enough of what I was doing to include a profile of the Tutor/Mentor Connection in the 1999 Illinois Kids Count Report. I view volunteer involvement in tutor/mentor programs as a strategy for expanding the number of people personally connected with this information and a way of building empathy that leads more people to expand what they do to affect public policy. I share these ideas and other ideas for expanding the number of people involved on this blog, the Tutor/Mentor Institute, and in articles I've been posting at Scribd.com along with numerous other places. I've even hosted a tutor/mentor conference in Chicago every six months since 1994 and have invited many of the people in today's symposium and involved in efforts to help kids in Chicago to attend. Yet, while many seeds are spread, and nurtured on an on-going basis, I'm still a small voice in the wilderness trying to enter a conversation with others who don't seem interested in what I have to say. I'll say it again. Unless people who want a better future for kids in poverty are willing to think through advertising/marketing and network-building strategies that expand the number of people involved into the millions, not much will change and we'll be still talking about this problem 20 years from now. You can browse the articles on this blog, my web sites, and search on Google for "tutor mentor" or "Dan Bassill" and try to understand what I've been saying. Or you can introduce yourself and set up a meeting where we can talk. If you've got the money you can put hire me to serve as a "virtual board" member for your company, non profit, university, etc. with an annual retainer and a monthly fee for a few hours of my time in one-on-one sessions where I try to help you understand and apply these ideas so you can lead them more effectively than I can. This graphic represents the range of learning, mentoring and social/emotional support that most kids need to go through school and into jobs. Based on the research and articles I've read over the past 35 years, kids living in high poverty areas don't have as many of these supports, so they have more challenges making it through school and into jobs and careers that enable them to raise their own kids outside of high poverty. 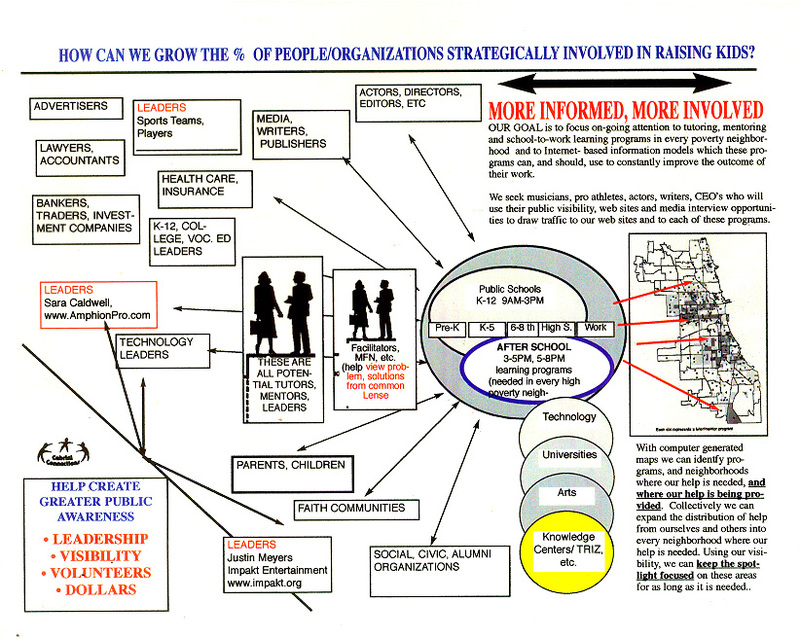 This graphic represents discussion groups growing in many different sectors, where people are looking at the same information, and looking at graphics like this. Each time they meet they are saying "What can I or my group do to help make these types of learning programs and opportunities available to more kids in high poverty areas." 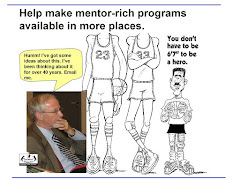 In this Tutor/Mentor Connection forum , I point to an article where Gary Walker of Public/Private Ventures talks about "mentoring as part of a larger set of actions". In the graphic above I show how volunteers who become part of tutor/mentor programs and build bonds with kids begin to treat those kids as if they were part of their own family, and thus begin to do much more to help them overcome obstacles of high poverty. In this forum I point to an article showing how mentors in Big Brothers/Big Sisters are concerned that they alone are not enough to help kids overcome poverty. My dream is to help more groups begin to use the information I've aggregated, and which others have created, to learn more about poverty and how it challenges kids and schools, and to learn more about ways they and their companies, churches and universities could use time, talent and dollars to build and sustain long-term volunteer-based tutoring/mentoring and career-focused learning programs in more places. There are already thousands of places around the country and in Chicago where people are talking about poverty, education, workforce development, etc. New ones keep starting every year. However, I can't find many of these using maps and graphics that illustrate a long-term birth to work vision, nor a goal of great programs in all poverty areas within a defined geographic area. If you know of these please send the links or add them as comments to this article. 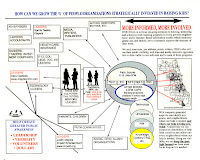 I could document that growth by visits to web sites (over 800,000 visitors recorded since I began to put info on line in 1998), social network analysis maps, or the increase in people participating in forums I host, or and increase in the number of links showing where such discussions are taking place. I can even show over 1500 actions taken since 2000 to achieve this vision. However, I need help to do this, both dollars, and talent. Others could document the same information and we could aggregate our information in libraries that show the results of collective efforts. People could work with me to do this by introducing themselves and joining the groups on the Tutor/Mentor Connection forum or by joining me on Facebook or Linked In. Is it unrealistic to hope that the number of groups using this information to support their own actions and involvement will grow? I don't think so.